The root of working in the aerospace field starts firmly in the classroom, said a Boeing test and evaluation pilot, speaking to cadets recently at the Qatar Leadership Academy in Al Khor. 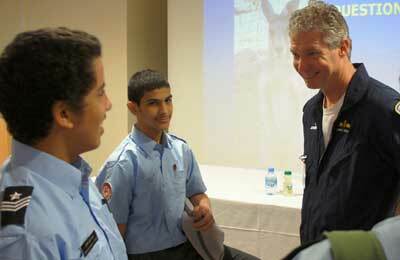 Ricardo Traven, chief pilot for F/A-18 Programs, was visiting the academy as part of a Boeing Lecture Series launched in January 2011 to support the educational goals of Qatar’s National Vision 2030. During the discussion with cadets, Traven shared stories from his decades flying military aircraft, stressing the importance of science, technology, engineering and math education, and the roles those disciplines can have on achieving a career in the aerospace industry. “We have an obligation to encourage the next generation of aerospace leaders to pursue their higher-education goals and to follow their career dreams,” Traven said. Previous speakers in the Lecture Series, such as a former Nasa astronaut, are chosen to provide real-life experiences and guidance to students pursuing careers in aerospace. The Qatar Leadership Academy is a boarding school formed through an educational partnership between the Qatar Foundation and the Qatar Armed Forces. “The session was an eye-opening experience for the cadets,” said Colin H Campbel, a leadership teacher at the academy.